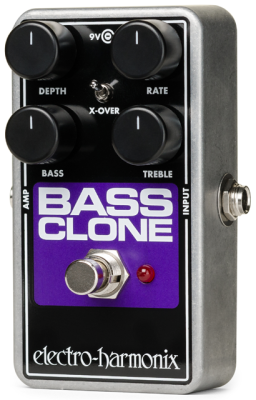 The Bass Clone chorus pedal's core circuitry is nearly identical to the legendary Small Clone chorus, but with added features especially for bass. Chorus is a combination of modulated and dry signals. The Bass Clone's Crossover switch cuts low end from the modulated signal so the pedal delivers a more accurately articulated bottom end with excellent note definition. The Treble control affects the whole signal while the Bass control only affects the dry half. Together with the Crossover switch they provide precise sound shaping that lets you achieve a tight, focused bass guitar sound with a well-defined low end and shimmering chorus on top.